Submitted photo The Wright-Patterson AFB fire department employs approximately 80 staff members comprised of firefighters, inspectors, paramedics and dispatchers, assigned at one of the three fire stations on the installation. WRIGHT-PATTERSON AIR FORCE BASE — Not only are the firefighters at Wright-Patterson Air Force Base required to know how to provide assistance to an array of facilities such as industrial buildings, laboratories and large buildings, they are also required to know the makeup of military aircraft. The fire department employs approximately 80 staff members comprised of firefighters, inspectors, paramedics and dispatchers, assigned at one of the three fire stations on the installation. Ensuring emergency response time is quick, two fire stations are located in Area A and one in Area B. Along with responding to on-base incidents, the fire department also provides assistance to local fire departments under a mutual aid agreement. Having industrial buildings, laboratories and large buildings on the installation, Grubb said that it also adds to the uniqueness of being a firefighter at WPAFB. Another difference with their counterparts, federal fighters pay structure is not set up like their counterparts. Staffing, training and safety concerns have been negotiated with Labor Relations and it is anticipated the Wright-Patterson Air Force Base local supplement agreement will soon be signed by all parties. 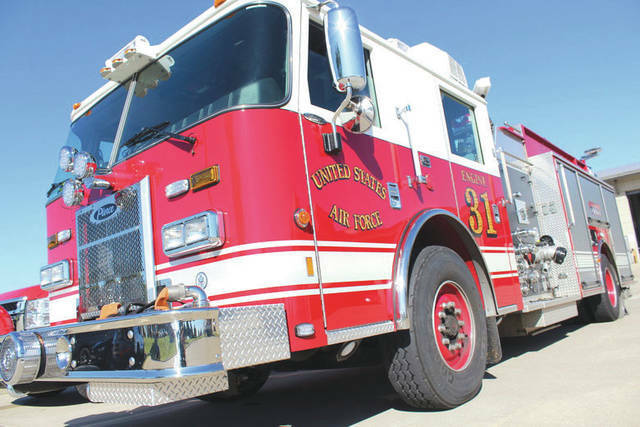 For a firefighter at WPAFB, they are scheduled to work a 48-hour shift for a total of 144 hours in a pay period. Dispatchers, inspectors and administration employees work 120 hours a pay period. For the duration of a shift, firefighters are required to stay at the fire house. A shift begins at 8 a.m. and ends at 8 a.m., 48 hours later. From 8 a.m. to 5 p.m. each day, on top responding to emergency calls, firefighters are reviewing pre-fire plans, conducting trainings and inspecting vehicles. After 5 p.m., while remaining on alert, they are allowed personal time and can do activities such as going to their room to relax, watching television or working out. Just like in television shows and movies, the firefighters really do cook their own meals. Firefighters will take turns preparing lunch and dinner during the week and breakfast and dinner on the weekends. Grubb said after spending so much time with each other in the fire house, it creates a close bond and as they get to know each other and their families. He said they know what’s going on in each other’s lives and are always there to support one other on and off duty. Grubb said with the support of the 88th Civil Engineering Director, Dave Perkins and Fire Chief Jacob King, the program was funded through Base Education and Training. Firefighters participated in a two-day course to learn how to be a peer supporter for their counterparts when that person may not want to talk to the typical outlets such as a chaplain or supervisor. Firefighter Brice Morgan said although a team of mental health experts responds after traumatic incidents to provide counseling for the firefighters, it was only care for the short term. Morgan said offering peer support will be beneficial for long term care. Grubb said he is also looking into expanding the peer support program and partner with the local fire departments. He said that way if a firefighter is not comfortable talking to someone within their department, they could talk to someone from another fire department. Grubb is hoping peer support will also help eliminate the “tough guy” attitude within the fire fighter community. The “Turning up the Heat on Cancer” campaign runs all summer through October. Awareness events will be held at various events and fairs around the local area. For dates and locations, go to the event’s Facebook page, http://facebook.com/turninguptheheatoncancer. https://www.beavercreeknewscurrent.com/wp-content/uploads/sites/49/2018/06/web1_180607-F-ME052-1003.jpgSubmitted photo The Wright-Patterson AFB fire department employs approximately 80 staff members comprised of firefighters, inspectors, paramedics and dispatchers, assigned at one of the three fire stations on the installation.